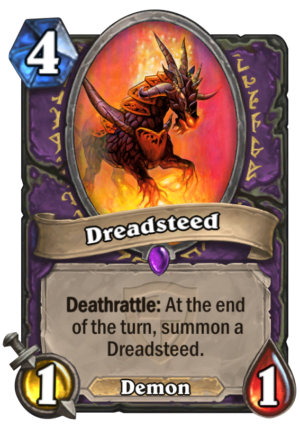 Dreadsteed is a 4 Mana Cost Epic Warlock Minion Demon card from the The Grand Tournament set! Deathrattle: At the end of the turn, summon a Dreadsteed. Crescendo himself summoned this steed, riding it to victory in the Grand Tournament. Wherever he rides, an army of riders ride behind him, supporting the legendary champion. Rating: 3.9/5. From 135 votes. The card was changed so it would not create an infinite loop with Defile. The flavor text for this card is in reference to the Reddit user Crescendo1909. 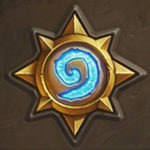 Crescendo sadly has cancer, and made a post saying goodbye to the community, and to the game he was passionate about: Hearthstone. We have now learned that Crescendo is still with us, so we wish him good luck in his battle! Crescendo has actually replied to the Reddit thread which you can read here. Keep up the good fight! Thx 2 Blizzard for releasing useless and boring cards, I can take a big break from hearthstone. As a warlock main I feel so hopeless…. I am sure you did not try it. It is so much fun and saved my victory many times. I have build a whole deck around this card and it is one of my most loved cards in TGT. I saw it prerelease and wanted to build a deck around it. Lucky me draw 2 of them in my Packs. And enemys of the Dreadsteed shall hope for not even more synergie in coming expansions. This card is unique in Hearthstone. This is the only infinite value card in the game so far. by playing this (4) mana card I am basically able to use the mage hero power for FREE for the rest of the game. but what I love about this card is that it makes so many unused cards potentially viable including Anima Golem, sacrificial pact, baron rivendare, and just maybe madder bomber (to trigger the death rattle). Dread Steed will be good enough to build a deck around (similar to grim patron). This card definitely makes my top 5 list. Pair it with Anima Golem? The dream: Warsong commander on board, the dreadsteed from a piloted skygolem. Honestly: I don’t see this card being any good. Warsong commander is a warrior card. Dreadsteed warlock. Oh my, the combo with Warsong commander, infinite board wipe, if you have enough time. So, basically an infinite whisp? The amount of yolo of this card is power overwhelming me… I mean its not even worth the owl..